Check out some info from the third year of Grrrlz Rock. The 2008 Grrrlz Rock! Concert series was a huge success. It didn’t make a lot of money; in fact, it broke even now for the third year running. This is a HUGE accomplishment. The true measure of success in this year’s month-long festival was its ability to engage a new generation of young performers, an ever growing community of pro-women artists and intellectually inspire students who not only enjoyed the shows, but also explored issues of equality and gender. We are proud to have accomplished such huge growth within just three years. This report is to briefly outline some basic facts and goals for future GR events. Months prior to the Grrrlz Rock! Events, Cindy Ingram and contractor, Kate Davidson looked to the community for sponsorship. These sponsorships ranged from $250 to $1,500. There were also several sponsorship packages that included partial in-kind contribution of services and reduction of fees, such as graphic design work. The funds raised from sponsorship covered the cost of pre-event printing, advertising and promotion. 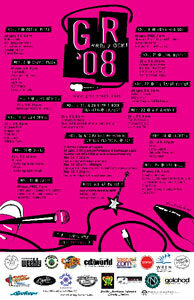 What are some other facts about the 2008 Grrrlz Rock Series? Events covered comedy, live music, dance, jam sessions, discussion groups, hair reception, dj dance party and a film festival. The Grrrlz Rock! Concert Series has grown so quickly, that creator and coordinator, Cindy Ingram can no longer run the event on her own. This year a new level of leadership came into play. This included several community members taking on responsibility for particular components of the festival. Panel discussion, film event and sessions were all coordinated by volunteers. The writing of promotional materials and coordination of most volunteers/interns was taken over by sponsor, Verve. In 2009, more departmentalizing will need to take place including vision, budgeting, booking of talent and sponsorship development. Anyone interested in volunteering your time to run the Grrrlz Rock! 2009 series please contact Cindy Ingram. We would love your help. Saturday Market #33: My Heros!